Support hanger / Cradle Module / ROLLER TURN : Products - TAKAHIRO ENGINEERING WORKS LTD.
We also prepare a supporting hanger bearing a jig base at both sides. This part assures the precision of flatness and perpendicularity necessary for a jig set-up and accurate processing. 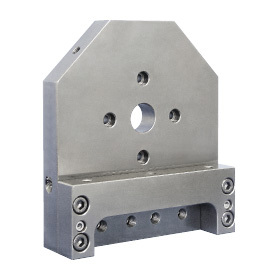 Using them with Support turn, and rotary joints, you can shorten a jig design time and set up procedure drastically.